Evernote, the popular memory collection and note-taking service, released its end-of-year user numbers on Wednesday and can now boast that it has “millions of users” — 2,062,015 to be precise. The announcement on the company blog includes some interesting stats about those users. For example, 74 percent have logged in from the United States and 76.9 percent have accessed the service through at least two different platforms. Lose It!, from FitNow, is the top choice of calorie counters, with 3.5 million downloads in the 14 months since it became available. But more noteworthy is that 190,000 people have bothered to rate the app, usually with high marks, which suggests that the software has some staying power. Based on a week or so of playing with it, the ratings are well-earned, and probably would be just as high if it cost a few dollars or more. At its core, Lose It! is a calorie counter and weight tracker, with tools for logging and watching your food intake. Enter a few personal metrics into the program along with your weight-loss goal and deadline, and Lose It! sets a budget for your calorie intake. Strange days indeed – somehow this (Facebook-based) application is supposed to convince you that Coke Zero tastes more like Coke. To use it, a visitor can gain access to the application through Facebook or by visiting cokezero.com and agreeing to let the application pull information from his or her Facebook account. The application examines the Facebook photographs of the visitor, then has the visitor add another photograph from his or her desktop or Web camera. Using facial-recognition software developed by an outside company, the application analyzes attributes like skin color, face structure and angles on the face. “It basically takes your face and turns it into raw data, then runs your face and matches it through the database of all these different people,” Mr. Benjamin said. To that end, Mr. Walk leads a team of about a dozen engineers, designers and project managers who are fine-tuning YouTube to give its users what they want, even even when the users aren’t quite sure what that is. The goal is to get them to spend a few more minutes on the site every day. Virtual goods such as weapons or digital bottles of champagne traded in the US could be worth up to $5bn in the next five years, experts predict. In Asia, sales are already around the $5bn mark and rapidly growing. For many, virtual goods are one of the hottest trends in technology and are fuelling huge growth in the social gaming sector. FT.com / Technology - Stage set for Google-Apple mobile duel: "By announcing a Google phone ahead of Apple’s tablet, the internet company had a chance to steal its rival’s thunder and build a following for its first Google-branded consumer device, Mr Kumar said. However, some analysts warned that if it created a rival gadget, Google would alienate other mobile handset makers that have used its Android mobile operating system in their own products. “If they’re doing their own phone, it’s really a dumb idea,” Ken Dulaney, an analyst at Gartner, said. Rather than produce its own phone, Google was more likely to put its name on the device and have influence over its software, Mr Delaney said." The attempted destruction of a Northwest Airlines jet over Detroit on Christmas Day has accelerated the search for technologies to detect explosives before they’re smuggled onto airplanes. But some security analysts see that pursuit as a waste. They say that the millions spent on high-tech gear such as the full-body scanner scheduled to be installed at Boston’s Logan International Airport next year would be better invested in improved intelligence sharing and training of airline employees and security personnel. CES is going to be a milestone event for publishers and readers. See the full Wired article for more on Blio. Ray Kurzweil, who thought up pretty much everything, ever, has entered the e-book fray. Due to debut at CES in Las Vegas next week, Kurzweil’s Blio comes from a completely different angle than the current e-ink readers. Blio is not a device. Rather, it is a “platform” which could run on any device, but would be most obviously at home on a tablet. The software will be free and available for phones, netbooks and so on. On its own, Blio looks solid, but it signifies something much bigger: the end of the paper book. Right now, e-books are poor copies of paper books, with a single advantage: convenience. A book is just a container for text, not its natural home. We fully expect the upcoming rash of tablets to provide a better place for reading words than these old wads of paper, usurping print the way Gutenberg usurped hand-copied manuscripts. Remember that lawsuit Nokia filed against Apple claiming that the consumer electronics giant was infringing its wireless patents with the iPhone? That alone might well have cost Apple a billion bucks, but today it gets even worse. Nokia has filed a complaint with the U.S. International Trade Commission (ITC), alleging that Apple infringes Nokia patents with almost every product it produces — from the iPhone to the iPod and all the way into its line of computers. FT.com / Media - Google in YouTube video plug: "Media companies would be better off handing their online video activities to Google’s YouTube video-sharing site than pursuing home-grown efforts such as Hulu.com and the US cable industry’s TV Everywhere initiative, according to senior Google executives. “At some point in time it becomes an economic choice by the content owners. It’s a matter of core competences,” Nikesh Arora, Google’s president of global sales operations and business development, told the Financial Times." 2010 is likely to see a lot of major acquisition activity. Weird to think that Citrix would likely cost more than Sun; see the full article for details. According to the Briefing.com rumor mongering financial news site, software giant Oracle - not even finished with its $7.4bn acquisition of Sun Microsystems - is sniffing around middleware and virtualization maker Citrix Systems and may be interested in acquiring the company. Oracle likes to be in control, as it soon will be with Java, so why not with x64-based server virtualization as well as application streaming and desktop virtualization? Oracle is a good fit for Citrix. But then again, Novell and Citrix could also merge. And as El Reg has pointed out more than once, IBM needs Novell and Citrix as much as Oracle might. Perhaps more. Trying to elude arrest for drunken driving, young people use technology to tell each other about the location of sobriety checkpoints, said Sgt. Dave Gibeault, head of the Fresno Police Department's traffic unit. Tools include Twitter, text messages and an iPhone application specifically designed to identify checkpoints, Gibeault said. If you get busted for drunk driving in Montgomery County, Texas, this holiday season, your neighbors may hear about it on Twitter. That's because the local district attorney's office has decided to publish the names of those charged with driving while intoxicated (DWI) between Christmas and New Year's Eve. If you're a fan of Google-is-getting-too-powerful-for-its-own-good conspiracies, this piece by independent security specialist Sherri Davidoff on her Philosecurity blog is a must read. Davidoff explores how Google is gradually gaining greater access to government data by landing municipal contracts from the city of Los Angeles, Washington, D.C., and others who have "Gone Google." Nearly 60,000 books prized by historians, writers and genealogists, many too old and fragile to be safely handled, have been digitally scanned as part of the first-ever mass book-digitization project of the U.S. Library of Congress (LOC), the world’s largest library. Anyone who wants to learn about the early history of the United States, or track the history of their own families, can read and download these books for free. Relax, You Can Still Buy An iPhone In New York City. Just Not Online. So if you really want to buy an iPhone in New York City, go to an AT&T store, or an Apple Store. Or try Apple’s website. That seems to be taking orders for New York City residents just fine ( I got up to the checkout). LG Display, the world’s second biggest flat-screen maker, has joined the rush among Asian manufacturers to make e-paper displays – specialised flat screens used in the the fast-growing electronic reader market. The Korean company on Monday signed agreements with two subsidiaries of Taiwan’s Prime View International, which supplies the key display component for popular electronic readers such as Amazon’s Kindle and Sony’s Reader. Those nice people at Google, engineers at heart rather than craven, money-grabbing business people, seem to have suffered a sudden attack of commercialism. The folks at the Silicon Alley Insider alerted me to this startlingly commercial ad on the Google home page. It can't be, I thought. So I went to Google.com myself and there it still was: a dry little thing in the right-hand corner suggesting that I should download Google Chrome. As the hierarchy/indentation above suggests, you can’t choose Google Apps unless you also choose Chrome. I wonder how much more Adobe had to pay, to have Reader selected by default (unlike Firefox, Skype, or RealPlayer). Looks like the marketing group has trumped the home page design group, inside the Googleplex. Newspapers, including this one, are weighing whether to ask online readers to pay for at least some of what they offer, as a handful of papers, like The Wall Street Journal and The Financial Times, already do. Indeed, in the next several weeks, industry executives and analysts expect some publications to take the plunge. People who have studied the problem argue that charging online would work only if consumers were offered a much-improved product with the convenience of access anywhere, on any digital device — the core idea behind the magazine consortium and its planned online store. AT&T has stopped selling the Apple iPhone in the New York metropolitan area through its Web site, perhaps due to data congestion, credit card fraud, or routine sales strategy changes, depending on whom you believe. Online sales of the phone were apparently suspended Sunday. Prospective customers attempting to buy an iPhone through the Web site and using a New York area ZIP code get a message saying, "We're sorry, there are no Packages & Deals available at this time. Please check back later." However, changing ZIP codes to other U.S. metro areas yields a bevy of iPhone choices. AT&T has come up with an ingenious solution to the congestion on its network in New York: stop selling the iPhone there! The AT&T website has stopped offering phones to the New York metropolitan area, and entering a zipcode from there delivers the message that it is “unavailable” in that area, according to a blog report. Rodale Books is proud to announce the publication of OUR CHOICE: A Plan to Solve the Climate Crisis (Rodale Books; November 3, 2009; ISBN 978-1-59486-734-7; $26.99; 416 pages w/ 4-color illustrations throughout) by former Vice President Al Gore. OUR CHOICE is the pioneering follow-up to Gore’s bestselling An Inconvenient Truth, in which he unequivocally laid out the case for climate crisis. With OUR CHOICE, he gives us the tools to solve it. During the three and a half years since the release of An Inconvenient Truth Al Gore has organized and moderated over 30 lengthy and intensive “Solutions Summits,” where the world’s leading experts (from fields as diverse as neuroscience, agriculture, economics, information technology, and more) have come to discuss and share their knowledge with the goal of finding the most effective courses of action. OUR CHOICE is result of the groundbreaking insights offered by these participants, whose expertise has made it possible to construct a fresh and unique approach not seen before. Highly recommended – buy the book, read it, and discuss the concepts with friends and family. All earnings for the book, as was the case with An Inconvenient Truth (book and movie) go to The Alliance for Climate Protection. There’s also a “solutions wiki” on the book site, but it isn’t accessible at the moment. This doesn't need to mean the end of book publishing. Publishers can no longer be vast containers of intellectual property distributed in paper form to bookstores, supermarkets and warehouse clubs. But they don't have to be: They can become highly selective distributors to bookstores, supermarkets and price clubs. That's the lesson of the television, music and movie businesses. But if the publishers want a role in the e-books business, they'll need to get over it and get on with it, embracing lower-priced e-books with higher author royalties. That seems unlikely. Because it's now clear that publishers just don't want to listen to what their customers are telling them. But should Google itself be trusted? Yes, trusted to produce terrific search results, reliable e-mail service, videos aplenty on its YouTube site and economical venues for advertising. But no further. As Auletta probes the sophistry behind the Google slogan "Don't be evil" with his well placed sources in media and technology, the portrait he draws is of a rapacious, opportunistic company that seeks to disrupt -- in classic capitalist fashion -- whole industries. Its Android operating system -- and now a cell phone of its own design -- have targeted the mobile phone business. Google Voice has been assigned to conquer the telephony industry. The Chrome browser and the Chrome operating system are aimed at toppling Microsoft's grip on the computer desktop. The Google Books service is a cannon pointed at the heart of publishers. One of Auletta's top sources regards the company as a veritable "Googzilla" that intends to become a digital Wal-Mart for shoppers. That revamped machine, known as the XO-3 and targeted for release in 2012, is still more of a pipe dream than a product. But early designs for the PC reveal a minimalist slate of touch-powered electronics that drops practically every feature of a traditional computer except its 8.5-by-11-inch screen, a scheme that would shed all of the first XO's child-like clunkiness without losing its simple accessibility. Amazon.com on Saturday released its annual post-Christmas statement on holiday sales, and made one thing clear: the Kindle was king, perhaps fueled by continued shifts in plans for shipments of Barnes & Noble's competing Nook e-reader. In another milestone for the e-reader, the company noted that on Christmas Day, for the first time ever, Amazon customers bought more Kindle books than physical books. Eric Sorenson's book, Seven Wonders for a Cool Planet: Everyday Things to Help Solve Glob..., is a short book with seven low tech ways to improve your carbon footprint. At the top of the list, is the bicycle; in fact, on the page on the Sierra Club website promoting the book, they allow readers to vote on "the coolest" of these devices, and so far the bicycle is leading the tally. Check the full post for more details. I think it’s a pretty safe bet that the Apple tablet won’t simply be a super-sized iPod touch. One significant item on many a wishlist (that won’t be under the tree this year) is the famed imaginary creature — cousin to the dragon, the phoenix and the sphinx — known as the Apple Tablet. According to a veritable smorgasbord of recent legends, a.k.a. rumors, we might not have much longer to wait — a 7-inch tablet could be revealed as early as January 26. A brace of new patents unearthed this week by Apple Insider point to a curious probability in relation to the tablet’s screen. The patent speaks of an “articulating frame” that may be raised or lowered to provide both a tactile typing keyboard and a flat surface for pointing. The device would employ some system of intelligence to help determine which mode the user was in, and dynamically adjust itself to provide a physically ridged keyboard or a flat pointing surface as necessary. We do not anticipate any interruption in the availability of Word or Office 2007. Additionally this ruling has no impact on the scheduled availability of the 2010 Office version which is planned for the first half of CY2010. Current users are not affected. If you are using the custom XML tags in Word 2003 or 2007 (these show up in Word as Pink Tags around tagged content), you are free to continue doing so with the products you have already purchased. Open XML standards (all ECMA and ISO versions) are not affected. Even if Word's specific implementation of custom XML support does infringe the i4i patent (which Microsoft does not believe to be the case), i4i has never claimed that its patent is essential to the OXML standard. Content Controls of Word (screen shot below) are not affected. In Word 2007 and Word 2010, this is a common method of binding document content to data stored in a custom-defined schema within a document. Two years ago, in his book “Rocketeers,” Michael Belfiore celebrated the pioneers of the budding private space industry. Now he has returned to explore a frontier closer to home. The heroes of his new book, “The Department of Mad Scientists,” work for the Defense Advanced Research Projects Agency, better known as Darpa, a secretive arm of the United States government. And the revolution they’re leading is a merger of humans with machines. Belfiore traces the agency’s origins and exploits from the 1957 Sputnik launching (which shocked the United States government into technological action) to the 1969 birth of the original Internet, known as Arpanet, to Total Information Awareness, the controversial 2002 project that was supposed to scan telecommunications data for signs of terrorism. His tone is reverential and at times breathless, but he captures the agency’s essential virtues: boldness, creativity, agility, practicality and speed. Some handy links, via Kindle Nation Daily. Note that you don’t need a Kindle device to take advantage of the amazing assortment of free books – you can also download and read them via the free Kindle clients for the PC, iPhone, and soon Mac, Blackberry, and no doubt other device/platform types (Android, Apple tablet…). I’ve also gotten into the habit of requesting Kindle samples, for non-free books – many of the samples are sufficiently extensive to provide a good sense of a book’s thesis and style. Now in invitation-only private beta, the new service sends out messages about the type and amount of the transaction, every time you use your credit card–at least the one you designate your “Blippy” card–for others to see and comment on. In other words, a kind of Twitter for spending. The twist of Blippy–whose motto is: “What are your friends buying?”–is that it is more passive than the more active tweeting or texting. Apple's stock closed Thursday at an all time high of $209.04, up 6.94 points (3.43 percent) in a shortened day of trading on unconfirmed rumors that the company might unveil a long-awaited portable tablet computer next month. The Apple blogosphere went wild Wednesday following several reports that the company told some of its key developers to prepare versions of their iPhone apps that will work on a device with a larger screen, in time for an event next month. Vonage now offers an unlimited $24.99-a-month international calling plan for iPhone and BlackBerry users, the company said Wednesday. The new "Vonage World Mobile" VoIP service competes with a $12.95-a-month service from Skype. Vonage, however, offers service 60 countries, while Skype offers unlimited service to only 40 countries. Current Vonage customers may qualify for a $10-a-month discount on the mobile service. Yesterday we reported that Apple is working to solidify a new round of content deals with TV studios. Meanwhile, publishers have been working on new versions of digital magazines that would be viewed on touch screen computers. 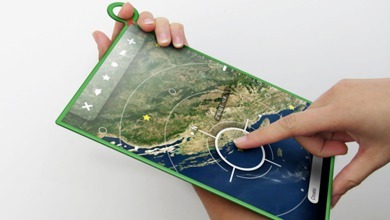 Apple has explored making tablet style devices for years, only to back off. The company also has a history of scrapping products very close to their scheduled launch dates. But momentum around the tablet has been building solidly. And Apple has refreshed its iPhone, iPod and computer lines within the last year, another indication that the January announcement will be for a new product. A former Apple employee, whose name appears on numerous Apple patents, worked on an Apple tablet five years ago and recently told me when the first version of the tablet was shelved by Steve Jobs, a lot of the technology made it into other devices. He explained that components of these early stage concepts are already out in the marketplace. If you have an iPhone, for example, you’re carrying around a mini version of an early Apple tablet. He also says that one of the barriers to producing the early tablets was the lack of software. The success of the App Store and the eagerness of the publishers show that this won’t be a problem for any new devices. The Apple tablet is threatening to approach Yeti status, but here's an indication that it will turn out to be real: the company has told some of its key developers to prepare versions of their iPhone apps that will work on a device with a larger screen, in time for an event next month. Add that to the news that Apple has reportedly booked the Yerba Buena Center for the Arts in San Francisco "for several days in late January," according to the Financial Times, and it's pretty easy to connect the dots. It's a very good bet we're getting a look at this thing within the next 30 days or so. Searching for meaning beyond a price tag, more holiday shoppers are giving custom-made gifts this year. But adding the personal touch doesn’t mean that gift-givers have to break out the knitting needles, haul out the scrapbook supplies or fire up the oven and start baking. A host of Web sites with names like Zazzle, Blurb and TasteBook are helping people quickly create one-of-a-kind products like clothing, books and jewelry. In some cases, making a custom gift can be as easy as uploading a photo or clicking a mouse. In others, the e-commerce tools shorten what would normally have taken hours of work. “If Disney and CBS believe this is the model to embrace, it’s worth pondering whether they’ll embrace that for all distributors,” said Melinda Witmer, Time Warner Cable’s chief programming officer. The Time Warner Cable comments underscore how much Apple’s possible subscription service threatens to fray the television ecosystem. TV companies make money by selling bundles of channels to Time Warner Cable, Comcast Corp., DirecTV Group Inc. and other distributors through which roughly nine out of ten American households watch TV. My decade 2010 prediction: Unchecked, Google's open approach and free business model will eventually disrupt most businesses that produce information. The news business is being disrupted now. Google will disrupt software products or Internet services, too. The RIAA, Hollywood studios and stock image companies should watch their backs for a Google knife. Google's power isn't so much the open philosophy as the free business model it empowers. Bill Gates asked the right question 33 years ago: "Who can afford to do professional work for nothing?" It's the question everyone should ask as Google's free business model expands. Is this evil? If your worldview is in line with Gates' -- that he or she who creates something should own it and profit from it -- the answer is likely "Yes." Perhaps it is not, if your worldview is that all things -- all information -- belong to everyone. Check the full post for more details. I think it’s actually more like “when it’s convenient for them” and inconvenient for Microsoft. Google is only open when it is convenient for them. Google will never open up the source code to its search algorithms or its advertising system, or share the core data which gives it a competitive advantage in those areas because that is where it makes all of its money. Immediately after the Windows 95 launch, Ellison called one of his lieutenants, Farzad Dibachi, to his mansion in Atherton, California. For years, Dibachi — who was responsible for brainstorming new business strategies — had urged Ellison to think more broadly about his company’s potential. Now, the two discussed a vision for Oracle that would neutralize Microsoft’s main advantage: the dominance of its operating system. They imagined a simple machine that would eschew software installed on a hard drive in favor of accessing applications online. Data — videos, documents, pictures — would be stored in Oracle databases instead of on the computer itself. In place of a robust operating system, this machine would work with programs and files through browsers like Netscape Navigator. Ellison liked the idea, and he and Dibachi started working on a speech so the CEO could share it with the world. The device would be called the network computer. LYONS: Have you been surprised by the Kindle's success? BEZOS: Astonished. Two years ago, none of us expected what has happened so far. It is [our] No. 1 bestselling product. It's the No. 1 most-wished-for product as meas­ured by people putting it on their wish list. It's the No. 1 most-gifted item on Amazon. And I'm not just talking in electronics--that's true across all product categories. We've spent years working on our physical books business, and today, for titles that have a Kindle edition, Kindle book sales are 48 percent of the physical sales. That's up from 35 percent in May. The business is growing very quickly. This is not just a business for us. There is missionary zeal. We feel like Kindle is bigger than we are. LYONS: So an Apple tablet would be a companion to the Kindle? BEZOS: Absolutely. We've got Kindle for PC. And we're working on Kindle for the Mac. Our vision is that we want you to be able to read Kindle books wherever you want to read your Kindle books. LYONS: Ultimately do you not even care about selling the physical Kindle itself? BEZOS: No, we do care. Our goal with the Kindle device is separate from the Kindle bookstore. With the Kindle bookstore, wherever you want to read we're going to support you. And then for the Kindle device, we want that to be the world's best purpose-built reading device. Project Canvas is a partnership between the BBC, ITV, BT, Five, Channel 4 and TalkTalk to develop a so-called Internet Protocol Television standard. It would see a range of set-top boxes available to access on-demand TV services such as iPlayer and ITVplayer. There is a certain irony in Apple benefiting so much from what was essentially a missed business opportunity a decade ago. After sitting out the digital music explosion begun in 1999 by Napster and pirates everywhere, Apple decided it was better to be late at the party than not show up at all and introduced the iPod MP3 player in 2001. Many thought the iPod was the best portable music player on the market and it sold well, helped by free jukebox software called iTunes. But the real breakthrough came two years later, when Apple introduced the iTunes Music Store, offering the first wide selection of digitised major-label songs for just 99 cents a song. Best of all, from Apple’s perspective, was that the store kept iPod users coming back again and again. The iTunes store was a service, consumers became accustomed to using it frequently, and it kept on selling almost free intangible goods cheaply. These were all traits which prefigured the App store. It seems apparent, based on conversations with multiple sources, that after the two sides tentatively agreed on a deal, Yelp came back to Google saying it had received a higher offer from another party. Why Yelp didn’t take that offer, which the sources said was in the vicinity of $750 million, is a bit of a mystery. The people who said Yelp walked away from the deal implied that there wasn’t a good fit with the other company. However, as Anthony Alfonso, president of Trenwith Valuation, told Claire Cain Miller, some of Yelp’s actions may have been an exercise in brinkmanship. For most people, Google and other search engines are essential tools to navigate the Web. But the workings of the text ads, the blurbs that peddle goods and services on the search results pages, are largely hidden from Web users. For more than one million businesses, Google’s search advertising system is like a hose inundating Web sites with traffic. Managing it effectively, though, is as much art as it is science. It requires a mix of analytics and gamesmanship, a combination of skills that has become vitally important in the Internet age. Apple is eliciting tentative interest from some networks in its proposal to offer a TV subscription package via the Internet. Theoretically, customers would be able to tune in online, allowing them to cancel their cable or satellite subscriptions. The internet may kill newspapers; but it is not clear if that matters. For society, what matters is that people should have access to news, not that it should be delivered through any particular medium; and, for the consumer, the faster it travels, the better. The telegraph hastened the speed at which news was disseminated. So does the internet. Those in the news business use the new technology at every stage of newsgathering and distribution. A move to electronic distribution—through PCs, mobile phones and e-readers—has started. It seems likely only to accelerate. The trouble is that nobody knows how to make money in the new environment. That raises questions about how much news will be gathered. But there is no sign of falling demand for news, and technology has cut the cost of collecting and distributing it, so the supply is likely to increase. The internet is shaking up the news business, as the telegraph did; in the same way, mankind will be better informed about his fellow humans than before. If paper editions die, then Bennett’s prediction that communications technology would be the death of newspapers will be belatedly proved right. But that is not the same as the death of news. To help Facebook establish ID standards that are even more universally accepted, the social network in August hired engineer David Recordon, co-founder of OpenID, a nonprofit foundation that maintains a set of open standards for Web identity. "Standards are the plumbing layer of the Internet," says Recordon, 23. "In order for them to be successful they have to be freely shared." OpenID was created in 2005 as a way to let people use a single name and password when they leave comments on multiple blogs, and it's currently offered by major Web sites, including Google (GOOG), AOL, NewsCorp. 's (NWS) MySpace, and even Facebook. Yet it's still not widely used, in part because of Facebook's easier-to-use system. "The open community has not met the challenge to provide a better alternative to Facebook Connect," says Chris Messina, an OpenID board member. While there are a lot of in-car wireless solutions, this one seems as if it is one of the easier ones, allowing you to use any USB modem to connect to the automobile, which then provides access to anyone in it with a password (yes, you can stop that snotty BMW next to you in traffic on 101 to stop stealing your signal). Ford’s SYNC cars are a lot like many other digitally souped up ones, with lots of data, voice-operated info and hands-free calling, but this is a welcome new innovation. According to sources close to the situation, along with its pending bid for Yelp, Google has been in on-again, off-again acquisition talks with Trulia, the real-estate search engine. It is unclear what price Google would pay, but sources estimate that Trulia's valuation ranges between $150 million and $200 million, although there could be a big premium on that. Rumors about Google's interest in the real-estate search market--and specifically in Trulia--have been rebounding around Silicon Valley for the last year. The two are among the many teenagers, especially girls, who are recognizing the huge distraction Facebook presents — the hours it consumes every day, to say nothing of the toll it takes during finals and college applications, according to parents, teachers and the students themselves. Some teenagers, like Monica and Halley, form a support group to enforce their Facebook hiatus. Others deactivate their accounts. Still others ask someone they trust to change their password and keep control of it until they feel ready to have it back. In October, Facebook reached 54.7 percent of people in the United States ages 12 to 17, up from 28.3 percent in October last year, according to the Nielsen Company, the market research firm. Google, which is currently on one heck of a spending spree, is closing an acquisition of San Francisco based DocVerse , a service that lets users collaborate around Microsoft Office documents, we’ve heard from a source with knowledge of the deal. The purchase price is supposed to be around $25 million. It’s not hard to imagine a slew of commercial applications for this technology. You could compare prices of a product online, learn how to operate that old water heater whose manual you have lost or find out about the environmental record of a certain brand of tuna. But Goggles and similar products could also tell the history of a building, help travelers get around in a foreign country or even help blind people navigate their surroundings. It is also easy to think of scarier possibilities down the line. Google’s goal to recognize every image, of course, includes identifying people. Computer scientists say that it is much harder to identify faces than objects, but with the technology and computing power improving rapidly, improved facial recognition may not be far off. So much for e-books in the “clouds.” It’ll still happen at Google. But a new service called Google Editions will do an Amazon.com, sort of—and sell e-book files rather than just let you read public domain books or preview commercial ones online. The link contains info for authors and publishers interested in offering their books this service within Google Book Search. News about Google Editions has already made the press, but it’s good to see Editions cranking up to balance out Amazon.com’s Kindle-based dominance of the e-book retail scene. Rumors are starting to swirl around the Web to the effect that Google might be planning to make a netbook. The idea is simple: By offering a netbook, Google can get its software out to those who want it, while taking in some of the revenue that it would otherwise lose by partnering with third-party vendors. At first glance, it might make some sense. After all, why would Google want to leave what could be major cash on the table? But a more thorough analysis of the market reveals that Google will never release a netbook. If Google is to be successful with Chrome OS, it will need to work well with third-party vendors. And it certainly can't step on any toes as it attempts to increase the popularity of its online operating system. The company simply can't afford to offer a netbook. The court in Paris ruled against Google after a publishing group, La Martinière, backed by publishers and authors, argued that the industry was being exploited by Google’s Book Search program, which was started in 2005. The court ordered Google to pay over 300,000 euros, or $430,000, in damages and interest and to stop digital reproduction of the material. The company was also ordered to pay 10,000 euros a day in fines until it removed extracts of some French books from its online database. No user information appears to have been stolen in the attack. But the security breach — the third major one at Twitter this year — underscores the continuing weakness of the company’s systems as its micro-blogging service is becoming more important to business and even global politics. The incident also highlights a basic vulnerability in the way life is lived as it becomes increasingly digital: With so much vital information stored on the Web, people are only as safe as their passwords. Hackers briefly blocked access to the popular Internet messaging service Twitter, steering traffic to another Web site where a group reportedly calling itself the "Iranian Cyber Army" claimed responsibility. Twitter later Friday posted a message on its blog that said its Domain Name Systems' records "were temporarily compromised but have now been fixed." The site says it will update with more details "once we've investigated more fully." CEO Larry Ellison spent his time on the conference call talking about Sun. He added that he expects Sun to improve market share and margins when the deal closes. That would be a good move considering Sun is being targeted by IBM and HP and losing share. Ellison also gave some insight to his Sun strategy. In a nutshell, he’s staying out of the high-volume, low margin game that IBM and HP play. Simply put, Ellison is taking Sun upmarket with hardware-software devices like the Exadata database machine. Exadata has been a hit, said Oracle executives, who noted that orders have tripled sequentially and the biggest problem right now is manufacturing enough systems. Sony on Thursday vowed to win the e-reader device wars by offering content owners a better deal than Amazon’s Kindle. “We feel we’re riding to the rescue of all of you,” he told reporters as Sony announced an agreement to carry content from three News Corp-owned news brands on its Reader devices. The Oracle Corporation said Thursday that its profit jumped 12.5 percent in the latest quarter and that it expected the European Union to approve its $7.4 billion purchase of Sun Microsystems next month. Oracle and Sun shares both rose in extended trading. In a sign that Google is interested in broadening its reach among local businesses, the search giant is in acquisition talks with Yelp, the review site for local businesses, according to three people with knowledge of the deal. The two companies have had conversations for several years, but a more serious round of acquisition talks began two months ago, one of the people said late Thursday. The companies have discussed a price and are negotiating the details, but have not yet signed an agreement. Sony Corp. said it will offer subscriptions to The Wall Street Journal and the New York Post on a new version of its electronic reader, the latest in a series of moves by publishers and consumer-electronics makers to loosen Amazon.com Inc.'s hold on the fledgling e-reader market. Sony said Thursday it will sell subscriptions to the digital edition of the Journal, as well as a daily news summary available only on the Sony device. It also said users will be able to subscribe to a daily summary of news and columns from MarketWatch.com, which like the Journal is owned by News Corp. The Wall Street Journal and the New York Post are offering exclusive subscription deals through the latest electronic reader from Sony Corp.
Sony’s new Reader Daily Edition, which sells for about $400, will be the only e-reader that carries the Post. Readers will have to pay $9.99 a month. And the Journal, which is available for $14.99 a month as it is on Amazon.com Inc.’s Kindle device, will have an optional aftermarket update for Sony subscribers for $5 more. One in five shoppers said they intended to use their cellphones to shop for the holidays, according to an annual survey by Deloitte, the accounting and consulting firm. Of those, 45 percent said they would use their phone to research prices, 32 percent said they would use it to find coupons or read reviews and 25 percent said they would make purchases from their phones. Amazon.com Bestsellers: The most popular items in Kindle Store. Updated hourly. This time he [AT&T CEO Randall Stephenson] put the call through himself, on his own, and the first thing he said when I picked up was, “Buddy, are you out of your goddamn mind?” I was like, Dude, I’ve got a bionic liver and I’ve been using psychedelic drugs on a regular basis since the early 1970s. Of course I’m out of my goddamn mind. I’m crazy as a loon. He started shouting, but just then — I’m not kidding — the call got dropped, because, see, I was on my goddamn iPhone and the damn thing can’t hold on to a call in downtown Palo Alto. Some intriguing analysis (via The Raw Feed). Tangentially, I’m surprised none of the Nexus One coverage I’ve seen thus far has mentioned variables such as Google’s mysterious fiber network and its wifi endeavors, and the possibility that Google might eventually seek to completely circumvent the wide-area wireless carriers. It could then partner with carriers to offer the phone for free — half the price paid by the carrier, and half by Google. Free is a very popular price. This would benefit the Android ecosystem by radically ramping up Android market share, which would provide an incentive for developers to write apps for it, which would incentivize handset makers to create phones. What this means, by the way, is that the Nexus One wouldn't compete with the iPhone at all — or any other high-end handset. An advertising supported Android phone would be a high-end phone for a low-end crowd — a discount smart phone. The phone wouldn't appeal to the fancy phone snobs, because the advertising would be locked down, and forced upon the user. So my radical proposal is that Google isn't doing anything radical. They're doing what they always do: Selling advertising and growing market share by giving away free what others are selling. In yet another eerie Richard Nixon parallel, Microsoft has a history of surprise rapprochements with once bitter foes (Apple, Novell, Sun, arguably China and they’ll probably end up bailing IBM out one of these days…). Why not add Mozilla to the list? It not only costs little to let the wookie win, but it helps on multiple fronts of the new competitive landscape. And maybe more importantly, is a powerful demonstration to the world just how much that landscape has shifted, all to Microsoft’s advantage amidst its metamorphosis from Evil Empire to benign-by-comparison former Evil Empire. Big concerns expressed on #BPM call about complexity of IBM's several BPM products -- Lombardi, FileNet, WebSphere Process Server, Webify. It doesn't show the overall increases reading but it does show the changes in the mix. From the UC-San Diego study "How Much Information?" The customized links are powered by Bit.ly, a New York-based start-up that has become the de facto service for trimming unwieldy Web addresses into bite-sized, easily shareable links. IBM decided to close 2009 with a bang by acquiring Lombardi, a privately held provider of business process management (BPM) software. Big Blue racked up a number of acquisitions this year including: data discovery software firm Exeros, database security firm Guardium, security provider Ounce Labs, and analytics provider SPSS. Lombardi marks IBM's 90th acquisition since 2003. Ford Motor Co. is working to offer drivers a way to upgrade the electronics in their vehicles, much the same way they can add applications to their iPhones and BlackBerrys. The car maker hopes to persuade software developers to tap the Internet service, GPS location-finding capability and digital-music setup already found in its Sync entertainment-and-communications system, which it developed with Microsoft Corp. Such applications, or "apps," might do such things as give directions to every espresso shop along a highway open after 9 p.m., or allow friends to follow one another to a location through a GPS process called "breadcrumbing." The potential drone vulnerability lies in an unencrypted downlink between the unmanned craft and ground control. The U.S. government has known about the flaw since the U.S. campaign in Bosnia in the 1990s, current and former officials said. But the Pentagon assumed local adversaries wouldn't know how to exploit it, the officials said. There are also some things your can do with Google Voice that might not be apparent at first glance, but can make the service even more powerful. After trying Google Voice's speech-to-text translation service for "This page is a wiki article. Feel free to edit it now," I got the following translation: "MySpace oracle reset. Is it now?" Is it the result of my mumbling, or is Google Voice just another tech pundit?